Low-cut one-piece sleeveless garment with legs and feet. Long-sleeved baby shirt used as an under- or overgarment, depending on its weight; its characteristic lap shoulders allow the shirt’s neck to expand when it is being put on. Hooded coat with a front zipper; it is sewn closed at the bottom and sometimes has no armholes. 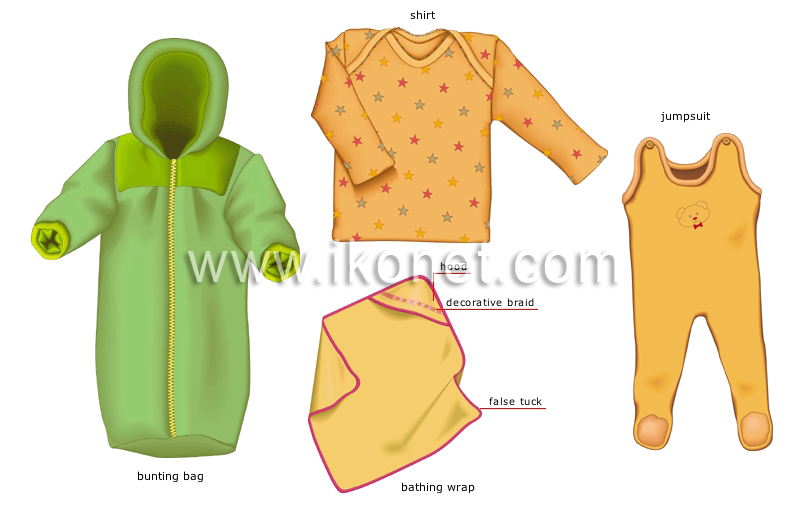 Absorbent piece of fabric with a hood at one corner; it is wrapped around a baby when it comes out of the bath. Narrow thick closely woven piece of fabric that edges or adorns a garment. Part of the garment that is pulled over the head. Strip of material designed to hide a garment’s seam or decorate its edge.